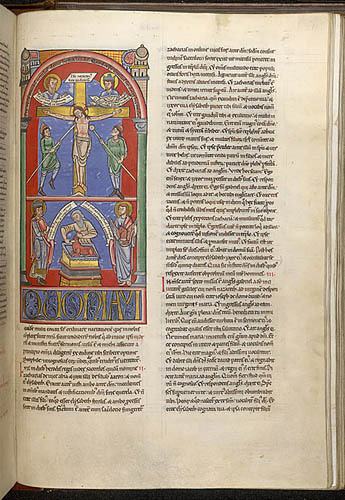 Each of the Gospels in this Bible, made for the Premonstratensian abbey of Floreffe, begins with an allegorical composition comparing events related in the Old Testament to those of the New. Here the animal sacrifice prefigures the Crucifixion, as made explicit by the text in the arch: ‘that Christ is the calf this titulus teaches’. Luke, to the right of the sacrifice, holds his symbol and a quotation from his Gospel (15:22).